From retail to software to food, businesses in every industry are looking at new ways (and tools) to attract new, potential customers. At MailUp we see this every day with our customers – from small-to-medium businesses up to multinational companies – who use our email marketing and SMS platform, and ask our advice on what the best practices are. Together, we help our customers reach their goals and strive to provide them the email and SMS tools to succeed. There are definitely some good stories to be told and learn from! This is why we’ve started a new case study series in the MailUp blog that showcases our customers – from around the world and in a variety of industries – and their success story and results in numbers. For easy and quick access our case studies will also be found on mailup.com. 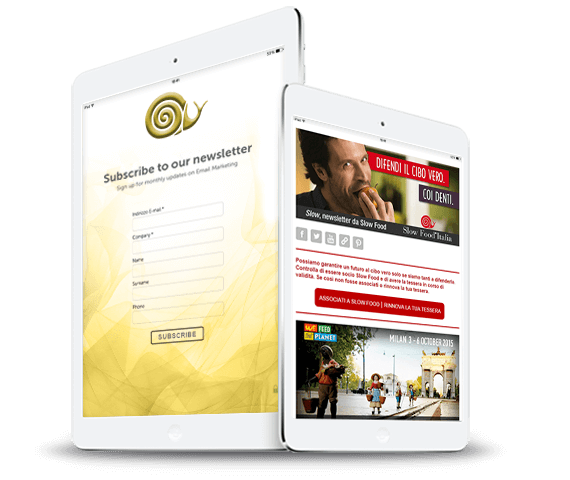 Our first case study showcases how Slow Food Italia is using the recently launched MailUp Jade App for iPad to grow their list of email subscribers… offline. A big marketing channel for Slow Food Italia are events, from local events to trade shows and many more. In fact, events are a great way for Slow Food Italia to connect with volunteers and members. They were also looking at an efficient, modern way of collecting event contacts into a mailing list. For this reason we put our Jade App to the test at the Cheese 2015 event. Find out the results of our test and take a look at our first case study with Slow Food Italia using the Jade App. Slow Food Italia is part of the global Slow Food network of over 100,000 volunteer members in more than 150 countries with the mission to provide “good, clean and fair food for all”. The recently launched Jade App is a mobile sign-up form app that allows you to leverage mobile sign-up forms on your iPad and digitize the way you collect contacts from events.